I feel like I’ve been living under a rock. Until recently, I had never owned a pair of Aerosoles. I’m usually the type of gal to go for fashion over comfort but the older I get, the more my feet have started to disagree with me about that. I’ve started to be aware of that aching in my heels from wearing flimsy flip flops. So this foray into Aerosoles has been a much needed relief for me. These sandals are now among my favorite. They’re the Chlockwork Sandals. From the first time I put them on, I couldn’t stop talking about how incredibly comfortable they were. They’re comfortable in a winter-boots-with-socks kind of way that you just don’t expect from something so cute. I literally gush to my friends about how comfy these are. At Aerosoles, you don’t need to sacrifice style for comfort. They’ve been working on finding a happy marriage between the two so that you no longer have to suffer with flip flops that feel like you’re walking on the bare streets. This bright color is also a great summer color. I love the colors of the ocean so this really hits home for me. 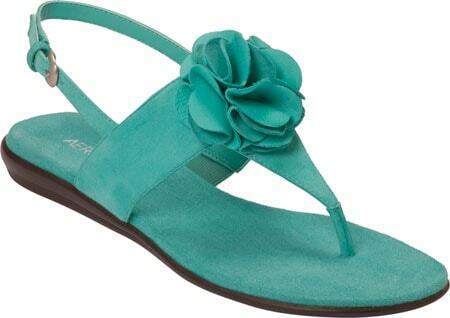 Click here to find out more about Aerosoles shoes. Company sent product for review. These opinions are 100% my own. Welcome to wearing Aerosoles! I’ve been wearing them for about 25 years – they are the best combination of comfort & fashion. Only two criticisms lately — they have become very expensive & the heels keep getting higher & higher – or completely flat. It’s not so easy to get a 1.5″ – 2″ heel anymore.